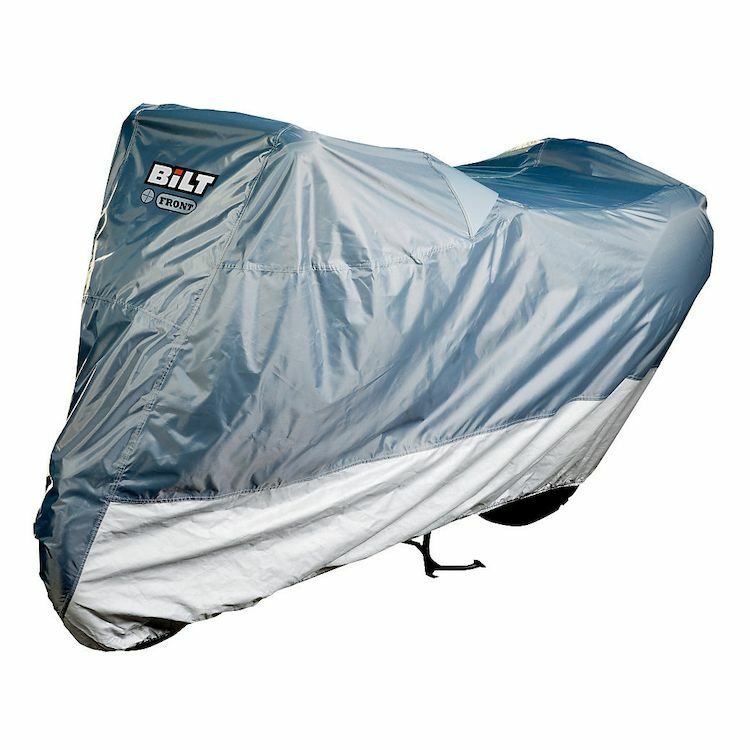 Protect your motorcycle from the elements with this waterproof cover. The Warranty says 5 years but mine only lasted a year before the sun ate it up. I bought 3 of them since I don't have a garage. They seem heavy duty but after a year the material deteriorated and became thin and split and did not protect the bikes any longer. The store told me that weather was excluded from the warranty. Why would they sell a cover that does not hold up to the elements? If I had it indoors I wouldn't need a cover. Good Thick cover with an even better warranty. This is a heavy duty weather proof cover that works great outdoors. But like any other cover it wears out after 8 mo in the sun. Water resistant wears off by the 6mo and the cover usually rips at 12-15 mo. That's where the amazing warranty steps in. I bring my old worn damaged cover and they toss me a new one. Wait for the sale, they are usually 1/2 off every few months. I have gone through 3 of these covers, just like other reviews, after it rains the cover will not stay waterproof. It soaks water like a sponge and will keep your bike wet for days. I keep taking the cover back to Cycle Gear and they exchange it, but this is becoming too much. They need to address this or not sell this as "waterproof". I use this cover during the hot summer months in AZ. When I purchased it I was looking at the cheaper cover and the sale man steered me away from that since it couldn't handle the heat. I use this cover daily now and it is holding up to the 110 Degree heat with no issue in 3 months. This cover has just been used to keep the dust and the sun off my bike. California got a freak rain storm in the middle of our drought. The cover is rain proof. It kept my bike nice and dry. I really thought if I spent more money on a cover that it would last longer. That was not the case with this cover. I used it to cover my bike outdoors and the wind and sun literally shredded the cover. Would be best to use if covering a bike in a garage to keep dust off of it. This cover is really durable and heavy duty, but it's probably best for someone whose bike is outdoors all the time. The elastic on it is very tight and catches on all parts of the bike. It takes me a few minutes to wrap it on my bike when I use it. The strap doesn't just clip on but requires fastening - so I never use it. 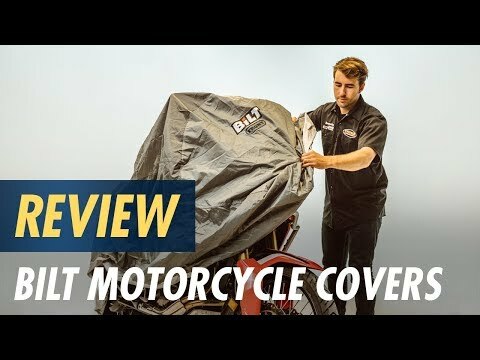 If I had no garage and my bike was in the weather all the time, then I would definitely want this cover. For occasional use, or something lighter and more easily stuffed into your backpack, I think I'd suggest something more lightweight. Use the extra large size on a Harley Cross Bones with the winter windshield attached and it fits well and is very durable.